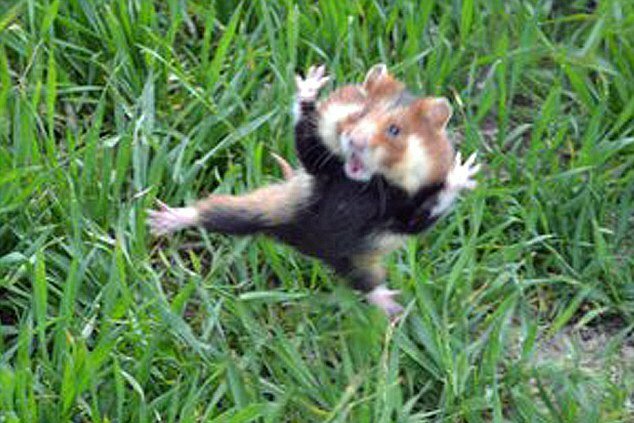 Home Tags Posts tagged with "kung fu"
Locals in Hradok, Slovakia, are currently living in a fear of this tiny tearaway – whose fearsome fighting skills have seen it dubbed the Kung Fu Guinea Pig. The pint-sized ninja terrified dog walker Marta Domotorova when it attacked her Hungarian pointer dogs during a stroll on heathland near her Hradok home. With a series of spinning kicks and leaps the fearless rodent saw off both the hapless hounds as they tried to play with it. Marta Domotorova said: “Bona started barking and Meggie wanted to sniff it. I guess it got pretty scared although both dogs are harmless and just wanted to play. Local wildlife experts think the furious furball is an escaped household pet. Others have questioned whether the guinea pig is actually a hamster and some cynics – believe it or not – have suggested the little critter’s flight may have had some digital assistance.